Thousands from across the country gathered to attend a memorial in the South Bay where fallen Officer Michael Johnson was remembered as a loving son and brother, a respected officer, and a mentor. SAN JOSE, Calif. (KGO) -- It was a somber day in San Jose as thousands from across the country gathered to remember fallen Officer Michael Johnson. The 38-year-old was fatally shot on March 24 while responding to reports of a suicidal man with a gun. He's survived by his wife, parents, grandmother, and sister. At Winchester Boulevard and Lark Avenue on Thursday morning, an American flag flew overhead as the procession traveled through. The hearse with Johnson's casket inside left the Darling Fisher Funeral Home in Los Gatos just after 10 a.m.
A memorial for fallen San Jose Officer Michael Johnson was held on Thursday, April 2, 2015 at the San Jose SAP Arena. The 38-year-old, who was a 14-year veteran of the force, was killed in the line of duty. Several hundred people were there silently watching and paying their respects to the fallen officer. Many that ABC7 News talked to said they were there to show Johnson, his family, and the entire San Jose Police Department how grateful they are for their sacrifices. "Well you know, I think it's important for everybody to be out here and show their respect and give the police department some support," said San Jose resident Patrick Donahue. "You know, they got a tough job to do and it's a dangerous job. You can't take that stuff for granted." Along the procession route were students and teachers from St. Lucy School in Campbell. They took a break from class to pay their respects. They lined the route outside their school on Winchester Boulevard holding American flags as the officer's funeral procession passed by. Thousands of law enforcement personnel came by for a final farewell to their fallen brother. Deputy Chief Daron Pisciotta with the Santa Clara County Fire Department was among those there to say thank you. "When the officers go down or are injured, we're there to help them, it's like a big family," he said. "So when this happens, it's a deep effect on all of us." Sacramento County Sheriff's Department Sgt. Rob Smith added, "It's a brotherhood, of course. When we lose one elsewhere, we've lost one of our own. And so, we're here to support them and their families." "We are a thin blue line," said Monterey Police Department Assistant Chief Dave Hober. "That is out there trying to do the right thing every day, all the time. And this is one of the ways we respect each other and come together." As people gathered to pay their final respects, workers in nearby offices gravitated toward the crowd. "I feel for his family," said San Jose resident Lou Kvitek. "And hope that they're taken care of, and just wanted to show them that respect. Hopefully they saw everybody out here today." San Jose firefighters paid their respects as Johnson's body approached the SAP Center. Sky 7 HD was overhead as the procession passed underneath an American flag supported by the ladders from two different trucks. 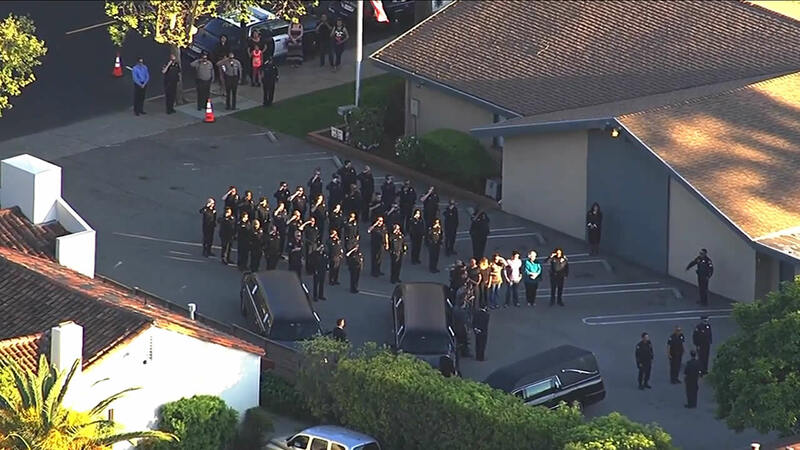 The funeral procession that started at Darling-Fischer funeral home in Los Gatos ended up at SAP Center in San Jose, where, through words and pictures, Johnson was portrayed as a loving son and brother, a respected officer, and a mentor. SJPD Chief Esquivel said a woman approached him last week to share how Johnson had sat down and counseled her troubled son. "She was crying because her son listened," he said. "It was that talk that changed her son for the better. He became interested in school, was not longer defiant, his attitude changed 180 degrees. That was Michael." Esquivel also talked about Johnson's quirky side and how much he loved to collect coins. Then he told the officer's wife, "On that miserable night, March 24, the only thing Michael had in his pockets were some keys and some coins. Bare essentials, rigorously simple. Well Nicky, I have those coins with me today and these coins are for you from Michael." 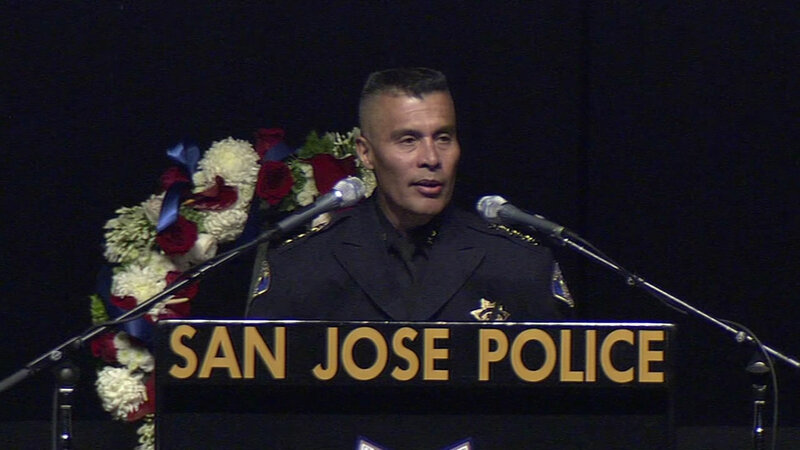 San Jose Police Chief Larry Esquivel speaks at the memorial service for SJPD Officer Michael Johnson. Johnson's patrol vehicle sat next to the stage. His coffin was flanked by two honor guards at all times. "Safety comes at a supreme price and that price must always be remembered by a grateful state and her people," said Attorney General Kamala Harris. Johnson's family made its first public appearance at the funeral, preferring privacy as they grieved. But as police commanders pointed out, this tight-knit family interspersed tears of sorrow with tears of laughter as they dealt with their loss. Older sister Jamie Radack said her brother always did things in a big way. "You and I might go to Starbucks and get a cup of coffee," she said. "Not my brother. He always ordered a venti quad-shot upside-down caramel macchiato with extra caramel." His sister also recalled playing cops and robbers when they were kids. "He always insisted on being the cops, and I always had to be the bad guys," she said. "That turned out to be fortuitous not just because Mike grew up to become a cop, but I grew up to become a lawyer." 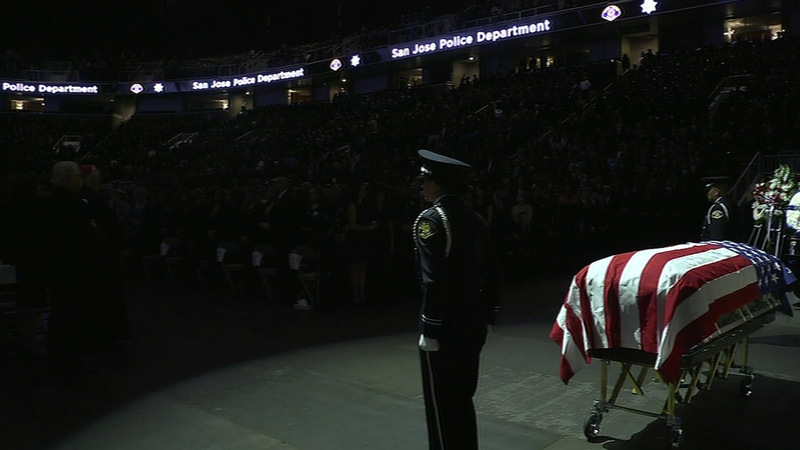 A memorial was held at San Jose's SAP Center for Officer Michael Johnson. The 14-year veteran of the force was killed in a shooting last week. The most touching remarks were made by police academy classmate David Solis, who is now an officer with the Menlo Park Police Department. "Death did not make you a hero, you were already a hero," he said. "You're forever stitched to us, bonded to us, and now your heart will beat through us." Johnson is the second member of his 2001 academy class and the 12th San Jose officer to be killed in action. Outside SAP Center after the memorial, helicopters flew in a missing man formation and Taps were played while Johnson's body was transported for burial. Law enforcement from across the region generously offered to fill in for San Jose police officers so everyone in the department could attend the memorial. Eighty one deputies from Santa Clara County helped staff SJPD while the normal officers grieved. The Santa Clara County Sheriff's Department had the largest number of manpower to back up SJPD. In all, about a dozen agencies helped out. "It's an honor yet sad at the same time," said Santa Clara County Sheriff's Dept. Captain Dan Rodriguez. "We always want to support our brothers and sisters in law enforcement and today I was very honored to have just numerous people coming out who wanted to help. Actually we had to turn people away." If you would like to extend your condolences to the officer's family and the San Jose Police Department, click here. We've posted a badge on Facebook for you to share, to honor his memory and his service. 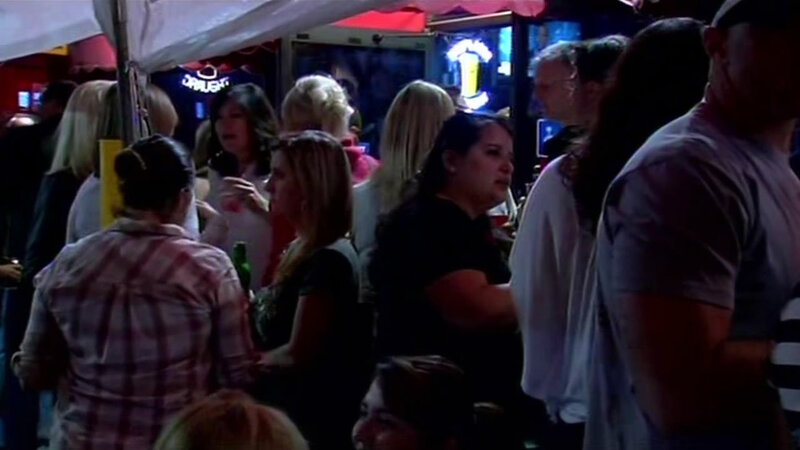 A neighborhood pub that's served as a police department watering hole for years hopes to raise $50,000 for the family of fallen San Jose Officer Michael Johnson. The SJPOA Charitable Foundation is accepting donations for the family of Michael Johnson. Please visit their website at: www.sjpoa.com to make a donation online. The San Jose Earthquakes will be holding an Easter Egg Hunt following the team's match on April 5 (available to kids 10 and under with a ticket to the match). A donation bin will be set up at the Guest Services Center behind section 101. Following the match, fans can donate upon checking in for the Easter egg hunt. In addition, donations can be made at www.sjearthquakes.com. All the donations will be coming to the SJPOA Charitable Foundation and then given to family. Next month, the Shop with a Cop Foundation of Silicon Valley is holding its third annual Salsa Sunday brunch fundraiser at the Loft bar Bistro at 90 South 2nd street in San Jose on May 17 from 11 a.m. to 2 p.m. Part of the proceeds will go to Officer Johnson's favorite charity and activities in his memory. Part of the proceeds will go to the Heroes and Helpers Holiday shopping spree for under-served children. Officials say the program has an educational component and is a great way for anyone to honor Officer Johnson because he was so deeply involved in the community.